The TMC6200 is the new high-voltage gate-driver with in-line motor current sensing for BLDC motors and PMSM servo motors of up to 100 A using external MOSFETs. 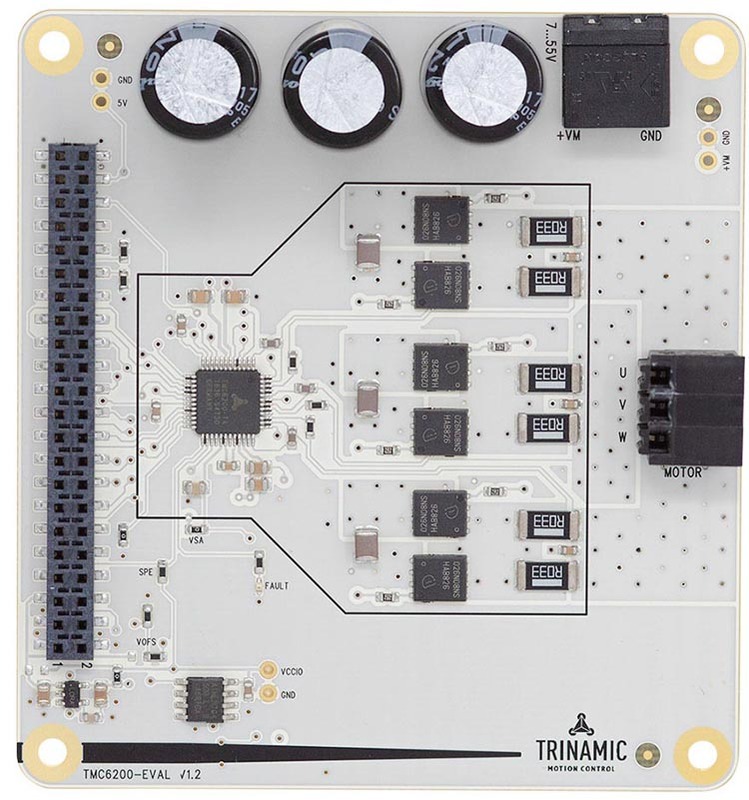 TRINAMIC Motion Control introduces a new high-power gate driver for PMSM servo or BLDC motors. The chip allows for powerful and flexible designs with a high current profile perfectly matching your motors. Three in-line sense resistors allow for current measurement that is robust against PWM noise. This makes the TMC6200 gate driver ideal for delta-sigma current measurement, which is implemented in the TMC4671. This type of measurement is more effective than bottom shunt measurement, which needs to be blanked out around the switching events and can only be used with SAR ADCs. Using six external MOSFETs and two or three sense resistors, the gate driver integrates the full high-voltage part of a PMSM drive system for 12 V, 24 V, or 48 V. Including in-line current sense amplifiers with programmable amplification. As such, it can drive a wide range of motors from Watt to Kilowatt, making it perfect for applications like industrial drives, factory or lab automation, robotics, CNC machines, textile machines, pumps, or other applications using PMSM FOC drives and BLDC motors. Offering stand-alone operation and SPI controlled operation including diagnostics, the driver IC enables flexible applications that can quickly adapt to new use cases and requirements. 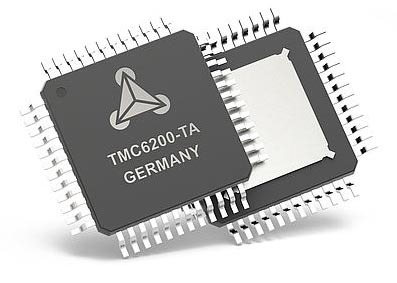 The TMC6200 is available from April 2019 via Trinamic’s distribution channels and comes as a 9×9 mm2 TQFP48 package.